The bars in Rome is a meeting place where people socialize and discuss the events of the day before dinner. Many of the bars do not serve only drinks, but you'll also find coffee, ice cream and snacks. Often the snacks is free. One place that stands out with elegant white-bearded owner who paints pictures. Piano bar with sing-alongs and an odd toilet with a wishing well. Pop star Shakira likes this place. Trendy place that serves sushi until 24:00 and after that it turns into a cocktail bar. Should be the the best place in Rome for celebrityspotting. 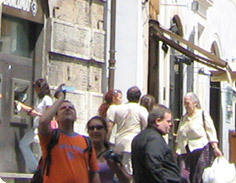 Despite congestion and more tourists you will still be able to spot movie stars and other celebrities here. A more casual bar with a lot of visitors. Like waiters in white jackets? THen this is the right place for you. The atmosphere of the 60s lives on. Thirsty tourists in Rome that missed to read my tips on bars in Rome.